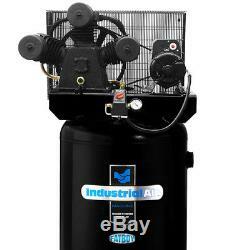 Industrial Air ILA5746080 240-Volt 60 Gallon 5.7 HP Vertical Air Compressor. 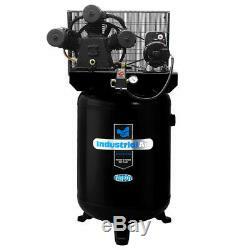 The Industrial Air ILA5746080 5.7 HP 60 Gallon Oil-Lubricated Stationary Air Compressor is a heavy-duty machine built to maximize performance. It features a stable cast-iron cylinder body with durable Swedish stainless-steel flex leaf reed valves and a Thermal Overload Protection System preventing any harm to the motor from voltage fluctuations. The 3-cylinder pump in this air compressor is made from one-piece cast-iron crankcase, providing up to 155 PSI of super high air flow that can withstand industrial settings providing you with a long compressor life. Its low profile design distributes the weight much more evenly, making it less top-heavy than traditional compressors. Cast-iron 3-cylinder pump provides super high air flow of 155 PSI for optimum tool performance. A Thermal Overload Protection System protects the motor from voltage fluctuations. Uniquely designed metal belt guard improves the cooling of the compressor pump. Oil level sight glass allows constant oil reading with an easily accessible oil refill design. Features a stable cast-iron cylinder body, durable Swedish stainless-steel flex leaf reed valves, and a 16 in. Balanced flywheel to extend compressor life. Low profile 60 gallon tank distributes weight more evenly, making it less top-heavy than traditional compressors. What's in The Box. 240-Volt 60 Gallon 5.7 HP Oil-Lubricated Vertical Stationary Air Compressor - ILA5746080. Air Consumption at 40 PSI (SCFM). Air Consumption at 90 PSI (SCFM). 29 x 37 x 62.5 In. The item "Industrial Air ILA5746080 240-Volt 60 Gallon 5.7 HP Vertical Air Compressor" is in sale since Friday, September 8, 2017. This item is in the category "Home & Garden\Tools & Workshop Equipment\Air Tools\Air Compressors". The seller is "factory_authorized_outlet" and is located in Ontario, California. This item can be shipped to United States.